We are beginning to understand the continuum of trauma and substance abuse disorders…and how they influence one another. But how can you address them both at the same time. This book just might be your way forward. According to the Substance Abuse and Mental Health Services Administration (SAMHSA), research has shown that traumatic experiences are associated with both behavioral health and chronic physical health conditions, especially those traumatic events that occur during childhood. Still, trauma and addiction co-occur often and in all kinds of populations. How someone responds to a traumatic experience is personal. But there are some commonalities in the ways we cope as humans, and the ways that we can help. So, if you’ve been through trauma…you ARE NOT DOOMED to live with lasting negative effects. While difficulties and stress reactions are normal,you can address these challenges and explore healing. Traumatic experiences can contribute to chronic physical and mental health conditions. But you can move through the pain and come out the other side. One way to do that is by reading a new book called, “Recovery from Trauma, Addiction, or Both” by Dr. Lisa M. Najavits. Herself the victim of a violent assault while in graduate school, the author’s personal empathy for trauma combined with trends in “Co-Occuring Disorders”, or the treatment of addiction and mental health disorders. 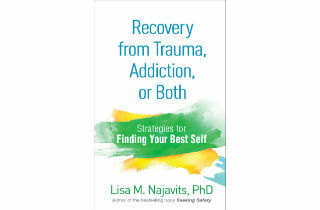 Her latest book presents science-based self-help strategies that you can use no matter where you are in your recovery. Every chapter features testimonials from people who have “been there” before you. Plus, the text is designed to be worked through over time. As a workbook, “Recovery from Trauma, Addiction, or Both works to your advantage. First of all, it’s based on clinical practice. Dr. Najavits has been using evidence-based clinical skills for decades. The text include background reading for context. Then, Dr. Najavits has included reflection questions, surveys, exercises, and action points in every chapter. Second, you can advance at your own rate, or use the workbook as an adjunct to talk therapy. It is truly a tool that can move you towards becoming your best self. However, be fairly warned. There is a lot of work to do. And most of the time, you may not want to approach that work on your own. Learn coping skills so that the future is better than the past. However, I personally think it best that you also commit to talk therapy. In my experience, scheduling regular, weekly appointments with a psychotherapist, addiction counselor, or a spiritual/religious guide is critical to moving forward. When we are hurt the most, we need a guide. When you’re ready to seek out professional support for treatment of addiction, trauma, or both, here are a list of possibilities. 1. Rehabs. Search the SAMHSA website. For rehab that specialize in trauma AND addiction treatment. Or, call our number listed on this page for confidential information on where to get treatment. 2. Professionals. Clinical psychiatrists or psychologists who have specialized in addiction treatment can offer suitable advice on resolving trauma and substance abuse issues. You can search the APA directory to find a psychotherapist and the APA directory to find a psychiatrist. Or, check with your State’s Department of Social Services to be connected to a licensed clinical social worker. 1. It’s best to treat trauma and addiction at the same time. It does not help to treat addiction first and then address trauma. You might actually be delaying healing or cause yourself unnecessary misery when you do this. Instead, a good treatment provider will address them both together. 2. You can shop around for counselors. The therapeutic relationship is something you need to feel comfortable with. And not everyone will resonate with your own personal need. So, don’t feel like you need to do trauma work with the first person you come across. Instead, take your time and vet the person first. Ask for referrals. And do your homework. 3. Re-living past trauma is not necessary to resolving it. Repeat that. This insight was MAJOR for me. Maybe I’ve seen to many movies with hypnotists…but I had a LARGE misconception about trauma work. So, just know that you do not need to smell, see, touch, or taste the past in order to live more comfortably in the moment. What a relief! Clearly, the effects of traumatic events place a heavy burden on individuals, families, and communities. However, research and practice are combining to offer us new pathways forward. This book – Recovery from Trauma, Addiction, or Both … is worth buying. In fact, it might just be the best book you ever buy. Why? Because you are worth it! This book offers just the right kind of gentle guidance toward positive action that it takes to change your life. But only YOU CAN DO THE WORK. Why not spend the $12 and get started today?